Polonium-210, the radioactive isotope fingered as the substance used to off exiled Russian KGB spy Alexander Litvinenko, is available to buy online for just $69 plus shipping and handling. 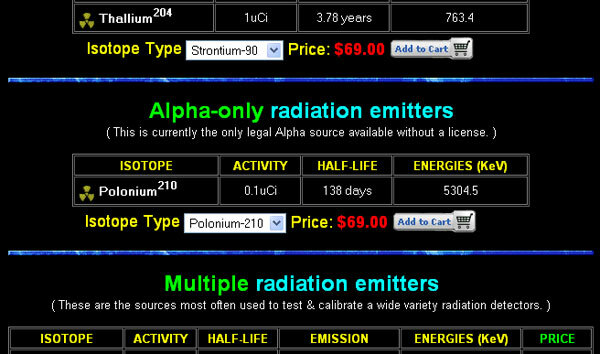 New Mexico firm United Nuclear Scientific Equipment & Supplies offers a sample of radioactive element on its website, as part of its aim of putting the "fun back into science". Litvinenko died at University College Hospital on Thursday, sparking a massive search of London locations for traces of the dangerous element. The BBC told us yesterday: "The radioactive substance implicated is as difficult to obtain as it can be to detect." Hmm. United Nuclear don't do international shipping, but we reckon a determined assassin might find a way round that. Since retreating to The Register's central London anti-nuclear bunker in blind panic when the poisoning story broke, we could have sworn we've been told by sections of the media the use of polonium-210 meant the assassination must have been sanctioned from the top. The only possibility was for Vladimir Putin having handed out vials of the stuff to an elite force of brilliant but disfigured hitmen in a disused provincial Soviet nuclear power station, we were led to believe. United Nuclear was set up by researcher Bob Lazar, who claims to have been involved in reverse engineering alien spacecraft which crash landed at Area 51. And yes, we know the amount in the United Nuclear sample probably wouldn't kill anyone, but that's not really the point of the above is it?